Chilly mornings are hard to wake up to. The bed is just so cozy and the sheets so warm. A nice warm shower can wake you up, but then you have to get out of the shower, and that is my absolute least favorite part. Your warm body once again hits that just frigid air and the process to get warm begins all over again. This is where warm beverages save the day. They warm you from the inside out. Not only that, but if the right ingredients are combined, they can even give your immune system a little boost before it goes off to fight all those germs that may come your way as temperatures drop. I love the taste of coffee and its aroma is magical, but I always get a bit jittery and feel a bit off if I drink a full cup. I usually drink tea- green or herbal most often- or drink half of a cup of coffee and save the rest for later. But are coffee and tea really are only options for hot drinks? Not at all! This little recipe is a request from my younger sister who wanted something warm to drink to keep her warm on the way to work and throughout the morning- something she could put in her thermos. 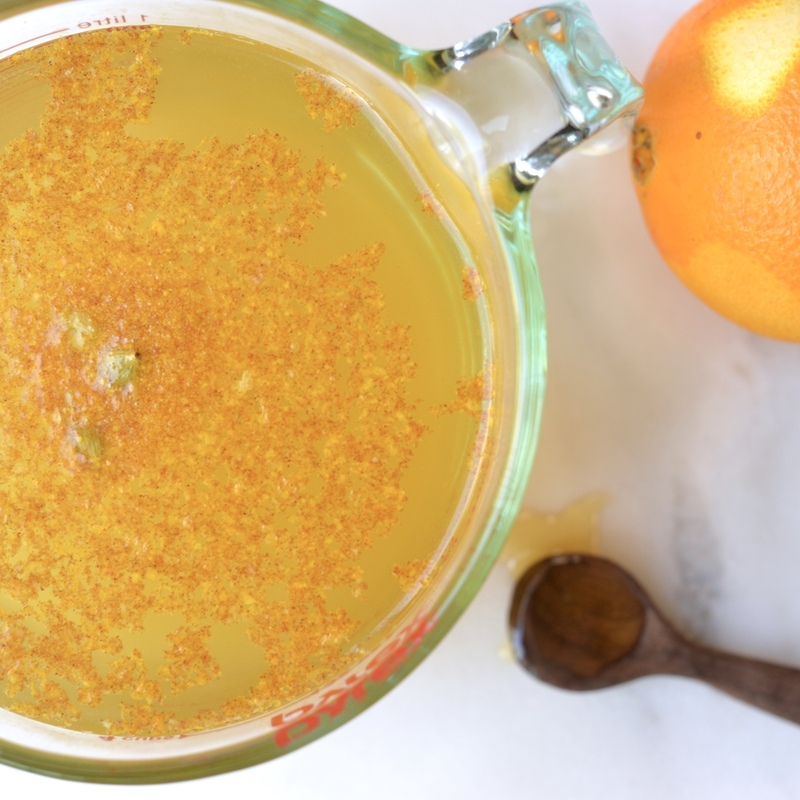 I wanted to make something warm and nourishing, so I combined some warming spices and energizing citrus for this drink. It is zippy with ginger, bright with orange zest, warming and a touch sweet with cinnamon and cardamom, and turmeric tames it all with the slightest hint of bitterness. I included the turmeric in here because of its anti-inflammatory properties and because it gives the drink a lovely hue. I do not think the photo justifies it, but it looks like a lovely autumn sunrise. I made a big batch of this at the beginning of the week and stored it in a covered jar in the fridge. You can enjoy it cool, or warm a little bit each morning to drink after breakfast. The fresh ginger and spices are a nice digestive aid and soothing on the stomach. Heat the water to boiling. Remove from heat and add remaining ingredients, stirring until honey dissolves. Allow to steep for 5-8 minutes. Strain and store in an airtight container in refrigerator for up to a week. Heat as needed. Enjoy! Makes 4 cups. I am not much of a smoothie-for-breakfast person. It always feels a bit more satisfying to chew on something. But that does not mean I do not like to have smoothies as part of an afternoon snack- especially when the weather is flower-wilting hot. This smoothie is a real cinch to make and perfect for taking advantage of those lovely peaches at the farmers' markets. 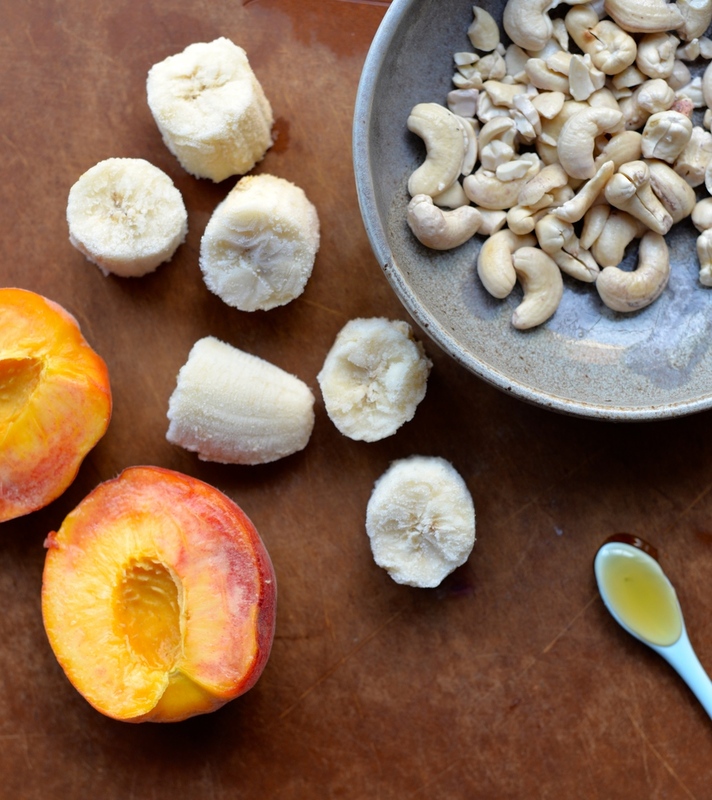 Peaches and bananas provide a fruity, summery sweetness while the cashews literally smooth the smoothie out. They make it lusciously creamy without the cream. They also provide some healthy fat and protein that prevent the sugar rush that you can get with fruit-only beverages. 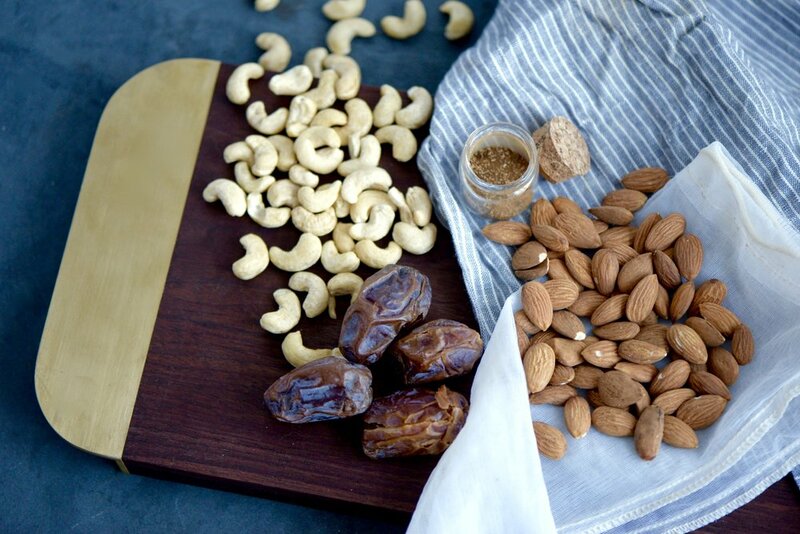 Just be sure to soak your cashews for a few hours in water (and then drain) to help them blend more easily. They key to making this cold without the ice is to use frozen bananas. If you use frozen bananas and frozen peaches, your blender will most likely throw a fit and refuse to blend unless you add a little water. If you only have frozen peaches, add about a tablespoon of water at a time while the blender is running until you get the consistency you want. I garnished mine with a bit of chopped pistachios because I love the pop of color they give. And a teensy pinch of flaky sea salt on the top will surely give your tastebuds a little surprise. 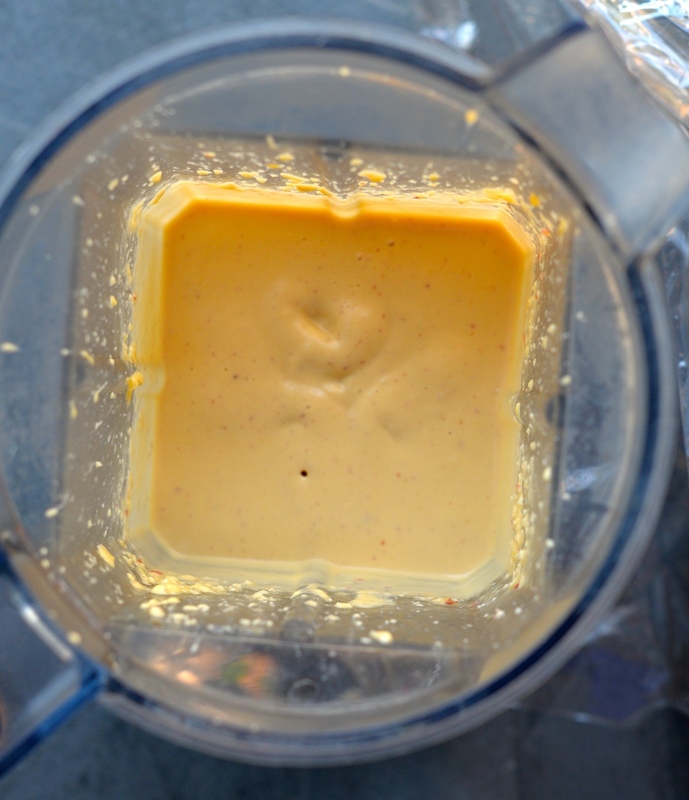 Place everything in a blender and blend until smooth. If smoothie is a bit thick to your liking, add a little water to thin it out until desired consistency is reached. Top with chopped pistachios and a pinch of flaky sea salt if you would like. Serves 1-2. Valentine's Day is as much about expressing your love for yourself as it is for expressing love to your friends, family, and significant other. This smoothie, or potion as I'm calling it, is the perfect way to wake up this Valentine's Day and say, "Self, I love you." Of course you can also make it for a loved one as an extra special treat to go with their breakfast in bed. It's easy on the eyes, and oh so yummy on the tastebuds. It requires a little thought the night before, but the result is worthwhile. It has healthy fats and protein from the chia and hemp seeds and energizing and antioxidant-fighting properties from goji berries, cacao powder, and maca powder. Strawberries, bananas, and spinach will provide nourishing Vitamin C, potassium, Vitamin A, and fiber. Did I say it tastes like a chocolate dipped strawberry? Sip, sip away. The night before, soak the coconut, chia seeds, hemp seeds, and goji berries in the liquid of choice. You can do this right in the blender. In the morning, add the remaining ingredients to the blender and blend until smooth. Garnish with cacao nibs and chocolate shavings if you would like. Enjoy!